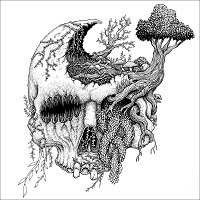 Belgium's MOSS UPON THE SKULL emerged in 2010 from the same swamps on which Brussels was founded, with the intent of playing unconventional, progressive death metal with a strong focus on philosophy, spiritualism, decay, and the mysteries of nature and the after-life. After two promising EP's, the band is back with a first full-length, “In Vengeful Reverence”, heavily influenced by esoteric, alchemical principles and alternative history, as put forward by luminaries like Michael Tsarion, Terrence McKenna, Aleister Crowley, or John Dee. “The album title refers to dealing with frustration, hardship or threat, not in an emotional way but with serene rationality, in order to overcome the adversity and remove the cause of the challenge,” explains singer/guitarist Jef Van de Weghe. “The blue flame concept informing the album represents the release of anger and frustration in a constructive and creative way. It makes sense to channel these energies into manipulating the world around us to serve our purpose, call it magic or willpower.” The album contains ten tracks. “Reverse Celebration” is up first. The mid-tempo riff has an old school feeling to it, and the vocals and low and deep. As it moves along, the riff and meter begin to shift here and there, with some vocal chants. “Disintegrated” is both shorter and faster moving, with steady dissonance along the way. At about the half way point, spoken words begin. The Progressive elements come into play with the ever-shifting meter, and they skillfully adapt to it. “Impending Evil” opens with slow and steady guitar chords, leading to a discordant sound, yet they still dexterously change with the mood of the song, making the transitions sound easy, with plenty of pig squeals. “Lair of the Hypocrite” is another punishing affair, with some more chanting. It sounds almost ritualistic, like someone dabbled into the black arts and now cannot turn back. The maddening pace doesn’t let up, until the end, where there is a drawn out and evil sounding closing. “Peristalith” gallops forward with hasty guitars and a time meter that is near impossible to follow. It settles into a groove very briefly and then darts to and fro from there, with heavy accents. The title track, “In Vengeful Reverence,” is slow and doomy, with a dark and defeated outlook. The guitar work here is quite masterful…sometimes easy on the ears while other times quick and attacking. “The Serpent Scepter” features a fairly easy to follow main riff, with absolutely anguished Death vocals. The riffs coil and release, seeming to come at you from all directions, while the song straddles the battle between life and death. “Spheres of Malevolence” is a shorter song with a burning intensity. The dissonance continues throughout, to the point where it’s hard to follow one main line of melody. “Unseen, yet Allseeing” closes the album. It the longest song on the album, at close to six minutes, which they pack full with a variety of different riffs, as drummer Jense keeps almost flawless timing in his fills. The ending is the first piece of beauty we have heard on that album…a perfect ending. The “rationality” they talk about in the album themes takes the form of these tight, impeccable passages of controlled chaos, when it seems like the album is headed in many different directions. The band clearly has a lot of skill, to be able to follow such a dense pattern of elements without missing a beat. Yet, it doesn’t sound robotic or overly sterile. Indeed, it is a living, breathing soundtrack to the overcoming of adversity.